Thank you to Vital Proteins for sponsoring this post! 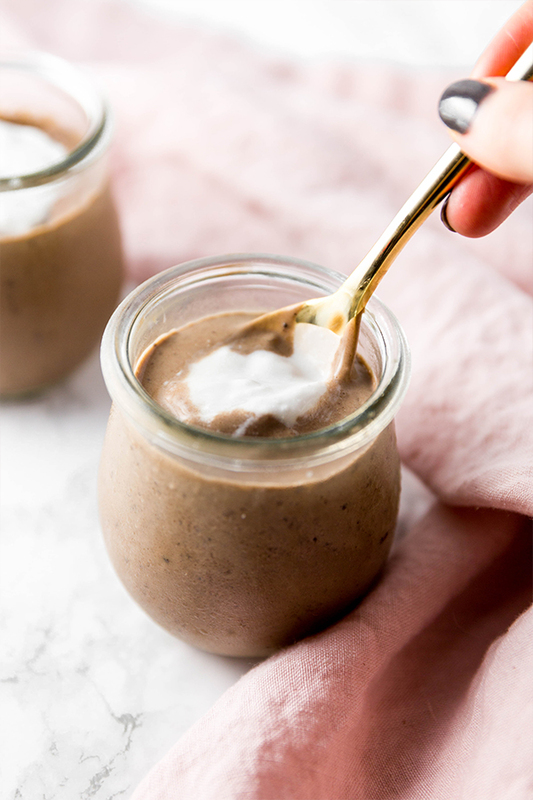 This peppermint mocha collagen pudding is a creamy, delicious, and nourishing treat! It’s both paleo and dairy free and is free of refined sugars. With the holiday season quickly approaching, so is all of the temptations of the holiday treats. Christmas cookies, Thanksgiving pies, and sugary seasonal drinks… just to name a few. Even if you’re a confidently healthy eater all year-round, the holiday season can bring our sweet tooth every time. So, how do you enjoy holiday flavors without sending yourself into a sugar stupor? 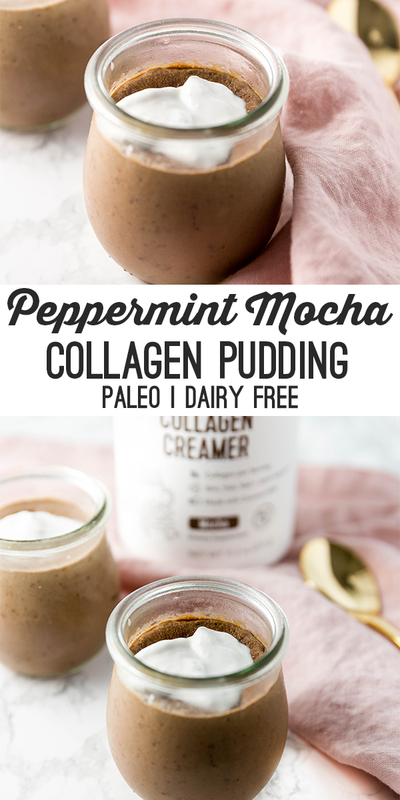 This peppermint mocha collagen pudding is an awesome alternative! This recipe makes two small servings of pudding, making it a great option to make during those times when you want just a little something sweet. You don’t always want or need to bake a dozen cookies when you have a sweet tooth! Plus, even my ice cream loving husband loved this modestly sweet little treat! He said that it was so good that it legitimately tasted like it was bad for you. But really, this pudding is anything but bad for you! What I love about this pudding is that it’s full of much healthier ingredients than what you’d find just getting a powdered pudding from the store. 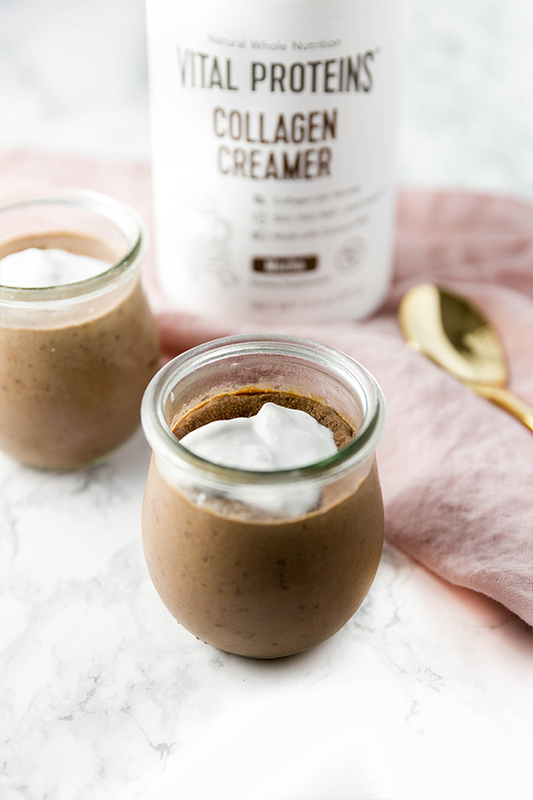 It’s made with grass-fed gelatin, coconut cream, maple syrup, and the secret ingredient… Vital Proteins Mocha Collagen Creamer! Coconut cream can be purchased by itself, of you can place two cans of full-fat coconut milk in the fridge overnight and use the cream that hardens on top. This adds some sweetness without going overboard. Cocoa powder adds color and more cocoa flavor to the pudding. Please note that cocoa powder is not AIP, and this recipe is an AIP reintroduction as a whole. If you don’t have any on hand, you can leave out the peppermint extract and just go for a chocolate pudding, but it really adds some seasonal cheer! Gelatin is one of my favorite ingredients to use in desserts! The gelatin gives this pudding the signature texture. 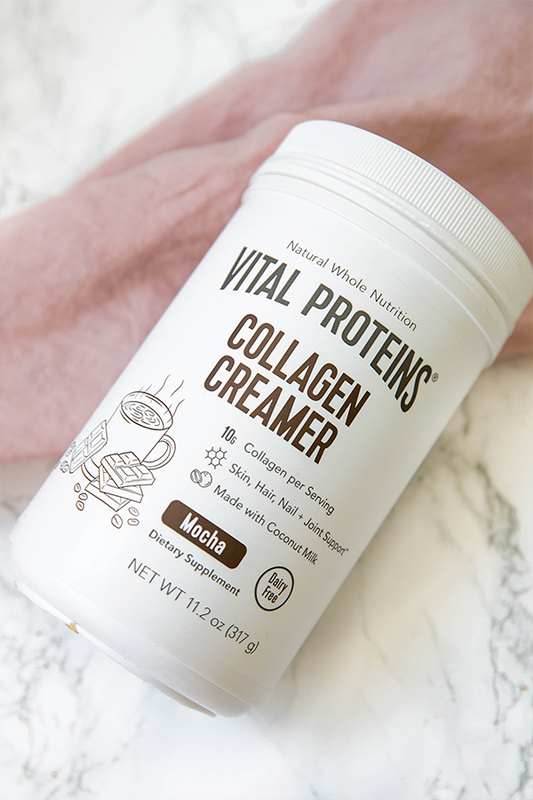 This Vital Proteins Mocha Collagen Creamer is the secret ingredient! It’s made with organic coconut milk powder and their grass-fed collagen. Not only is it great for adding to drinks, but it makes this pudding super creamy and delicious. I’ve been using Vital Proteins Collagen for years, and I love how it helps me to feel satiated and what it’s done for my nails! If you haven’t tried adding collagen to your diet yet, this mocha creamer is an awesome option for getting started. 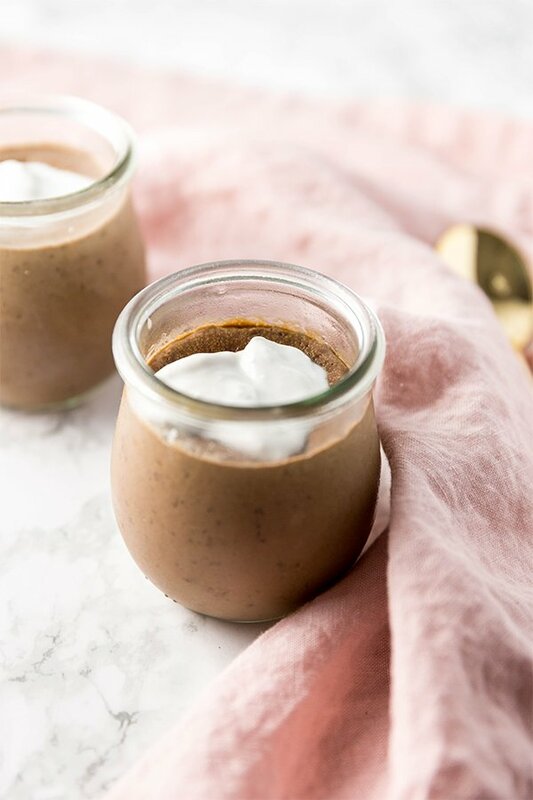 You can make fun recipes like this pudding, or simply add it to your morning coffee for a creamy flavor and added benefits for hair, skin, nail, joint, and gut health. Pour the coconut cream into a pot and set it on the stove on medium heat. Add the two scoops of the collagen creamer to the coconut cream and whisk vigorously to thoroughly combine for 1-2 minutes. Make sure the creamer is fully incorporated and that there are no clumps. Stir in the cocoa powder and maple syrup continue to whisk for another minute. Bring down the heat and allow the pudding mixture to cool a bit before adding the gelatin and peppermint extract. Bring the heat back up and whisk to combine for another minute. Remove the mixture from the heat and allow to cool slightly before adding to two small jars or ramekins. Place in the fridge to solidify for 3-4 hours. Remove from the fridge and serve with more coconut cream on top if desired. This recipe is paleo and dairy free. The ingredients are not all AIP, so this pudding is an AIP reintroduction. Hi! If I have a different kind of grassfed collagen do you know how much I could add to make the pudding? I have been using Great Lakes unflavored gelatin. This mocha collagen is more than just collagen, it also has coconut milk powder in it and flavoring so it wouldn’t really swap 1:1.